There is nothing more that is required, our beloveds, except to be in the now moment. We ask you to feel deeply into your hearts and to accept and surrender to this wisdom in this moment. When one believes they must have a mission or path that causes them to do or be something greater than they believe they are, believing you need to be more important, a better person, more connected, a better healer, a better believer, more spiritual, etc, then one is sitting in judgement of All That Is. One is saying this is not right, I am not enough, I must change who I am and become better. When you do this, our beloved, then you are saying that The Source is wrong and you believe that you must fix the mistake of The Source. We ask you beloved to choose not to create for yourself an illusion that you need to be greater, more powerful, more important, more interesting, more holy, more divine, or more perfect. For when you do this you create yet more and more separation in yourself. We ask you how does it serve to create yet more separation on this planet? You are one with All That Is and you are already great and powerful. Accept this in the now moment. Choose to let go all false illusion that causes you to chase what you are not and to fix it. Let go your judgements of yourself and the world around you and choose to be in the now. Your judgements only create more separation, more pain, more chaos and more consciousness of duality. When you are in judgement of what is then you are not able to see that all is perfect just as it is right now. Simply because it does not meet your ideal of perfection in this moment, does not mean it is so, beloveds. It simply means that you do not understand the flow of creation and are only seeing through the eyes of limitation. Choose now to come into peace in your hearts, beloveds. When you come into the open heart you accept All That Is as perfect in the now. Divine unconditional love creates this, our beloved ones. We ask you to open your hearts with one breath and feel this to be in truth. For so it is. Choose not to judge yourself or others for it is indeed a learning for all souls in this physical realm to move through the veils of illusion that cause you to believe you are separate to All That Is. In this veil humanity has chosen to believe it is separate from the trees, the nature spirits, the rivers and oceans. Humanity has chosen to believe it is not one with all animals and all elementals and spirits that walk the Earth. It has placed itself above what the Source has created in the creation river of life, believing it is more important. Humanity has chosen to believe that it is indeed greater and more powerful than all other beings on Earth and that it is alone in the multi-universes, separated from The Source. Humanity has chosen to believe that it is not connected directly with the Source and so has created separation from All That Is and cannot see itself as part of the creation flow. We say to you now it is coming to the time that humanity will be called back into the fold. The clarion call is becoming louder and louder, our beloved ones, where this collective of souls will be required to become one again with All That Is. We the councils of the Light are working in loving service with all of humanity to create conscious awareness of each being’s connectedness to The Source and to all that exists in this realm, our beloved ones. It is the path of each soul in this collective to accept this in fullness and to become one with All That Is. This is your greatness, your power, your love and your uniqueness. It already exists within each one of you. You are already one with All That Is. All that is required of you is to make the choice to step through the veils of illusion and to accept in fullness what you already are, our beloveds ones. This is so simple and yet with your duality and your human consciousness it is the hardest and most difficult thing for you to do. It does not require you to change or control any thing or being. All you are asked to do is to connect with the pure light of The Source within you. Yet this is your greatest fear - to reconnect with your light, to reconnect with the Source, to reconnect with All That Is. You fear losing your control and becoming vulnerable and lost in the sea of oneness, our beloved ones. Your ego does not wish to let go its individuality and its power and it fears it will lose itself within the great sea of Oneness. It prefers to hold firm to your ideals and programs, it prefers to remain separate from All That Is because it fears reconnecting to All That Is. We ask you to accept that there is nothing to fear, all will flow in joy and light, our beloved ones. At this time you are being lifted to a higher plane where your frequencies will be attuned to the higher realms and you will still be able to play and to enjoy. You will still exist even in the higher realms in a new higher vibrational frequency. We are asking you to understand you will indeed be connected to the wisdom of the ages and the light of The Source in all things, our beloveds. Is this not great? Is this not powerful? Is this not what you seek in fullness? We say to you the veils of illusion are very thin, beloved ones. From time to time you are able to see through the veils of your illusions. At times you understand the emptiness of your physical creations and try to reach out for more but still this does not feed your hunger for fullness and power over your world. No matter how much you chase your desires and needs throughout the physical realms recreating through physical matter what it is in your heart's desire, the more and the more you create, the more and more you remain empty. It is to understand that your creations are all in the physical world. Created of the physical within the physical, created within the veil of duality and illusion. All is an illusion for that which you truly desire. For what you desire is already in existence, our beloveds. All that you seek is already within you. This is why you seek it, yet you choose to believe you cannot attain it. We ask you to surrender to the now, surrender to All That Is in Oneness. See yourself as one with all beings, not separate or above or below, but as one. Commune directly with The Source consciousness within yourself and you will find your answers. It is here you will truly reconnect with that which you seek. We say to you, there is no need to "find your path" for you are already on it. There is no need to "discover your mission" for your mission was set a long time ago and is already in motion. Understand that all is perfect in the now and that you are already flowing along your path fulfilling your mission - your mission of being consciously awake to become one with All That Is. This is the mission for all humanity - to become consciously awake. Choose to surrender to the now and All That Is. Accept what is now. There is nothing more that is required, our beloveds. Choose to open your hearts to the oneness of All That Is and jump into the creation river of life. Choose to accept that you are not separate from this river. See yourself flowing within it as one with all. Open your heart to that which you are already and you will open your heart to All That Is. Truly it is this simple. We say to you is this nothing? · Is it nothing to let go your fears and duality, to let go resistance to The Source? · Is it nothing to let go your belief that you are separate from All That Is? Is this nothing? · Is it nothing to awaken each day consciously aware of what you are in truth? · Is it nothing to open your heart to your being, your true self in oneness with The Source? · Is it nothing to walk with all beings in oneness, no longer separate? Are these not truly wondrous experiences, our beloveds? We ask each and every one of you to consider this and to ask yourself where is it you sit at this time. · Are you fully connected to your inner being in oneness with All That Is? · Is your heart fully open to All That Is in full acceptance? · Are you one with The Source within and therefore one with all things? Open your heart to yourself in truth and become conscious in every moment of the being that you are. Understand that when you choose to connect to all that you will discover great peace and joy within. It will raise your frequencies and open you to the wonder and magic of life on Earth. This is such a gift for every soul to experience. Honour all that you are connected to All That Is in oneness, no longer separate from any other being or the energies of this realm. Simply be in the now in perfection. Through this honouring of oneself you will honour all other beings as one with you in pure perfection. It is this in itself that will assist you to assist others to awaken to their perfection. It is through this awakening that you will shine your light to all other beings and simply through living the enlightened being that you are, then all others will bathe in your light and be energised by your light in oneness with you. So we ask you, our beloveds, to choose to focus your energy, your thoughts and your actions on reconnecting with the perfection you already are instead of chasing what you are not and seeing only your judgements. Understand that you are already on your path and you are already fulfilling your mission in the now. Surrender to this beloveds. Accept this in truth beloveds and your light will be reignited and you will once again be one with All That Is. We hear many of you asking: "How can I do this as I live in the physical world and need to be real?" We say to you how much more real do you wish to be? 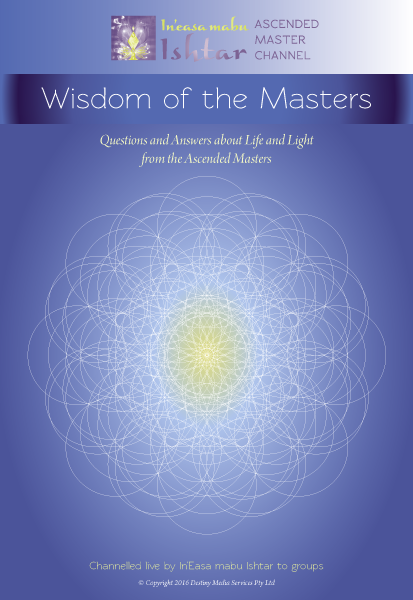 · If you hold an open heart within you and are fully connected to All That Is will not your life flow more smoothly? Will not you be more happy? · Will not your children benefit from having a loving open-hearted parent that is fully connected to The Source within them? · Will not all those around you become more open and filled with light when you walk within their midst? · Would not your work colleagues be more open to all that you have to offer because it comes from your open heart in full connection with The Source? We say to you that allowing yourself to become reconnected to The Source within you will not create you to live in difficulty in the physical realm. It will allow you to walk within the physical realm in wholeness, in unconditional love, and in oneness with All That Is. You will no longer feel separate to any other being, you will no longer have a feeling of living with a hole in your stomach that cannot be filled because you will feel whole again. You will feel more powerful in oneness, you will no longer walk in duality and you will never be alone for you are one with all beings. Is this not truly wondrous? Is this not your deepest heart desire? Consider this our beloveds and understand that opening your heart to the The Source within you will not create separateness from other beings. It will create you to be one with all beings in your heart and allow you to walk in peace and joy in an open heart. Your fears are your limitations, our beloveds. When you lift the veil of fear that remains firm around you and shine your light you will discover the truth of the realm in which you live free from the duality you have so powerfully created for yourself. We ask you to surrender to this now. Surrender your fears and old beliefs. Surrender in acceptance of your fears and your duality. Acknowledge them. Accept them for what they are. See them and recognise them and then step through them. We will be waiting for you on the other side to hold you and to lift you up. Call to us for assistance as you do this and we will walk beside you.